The markets today opened sharply lower tracking weak cues from the Asian markets. Further the profit booking continued among the selective scrips mainly led by the Metal, Auto, Pharma and Oil & Gas stocks. The broader market indices are also witnessing seling pressure in the opening trade as both the BSE Mid Cap and the Small Cap index are now trading with a loss of more than 0.5% each. 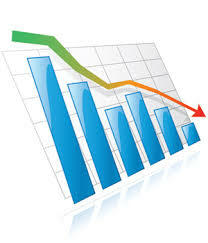 The BSE Sensex is now trading below the 15100 mark and the NSE Nifty below the 4550 mark. The BSE Sensex is trading down by 162.79 points or (1.07%) at 15,075.15 and the NSE Nifty is trading lower by 44.80 points or (0.98%) at 4,538.60. The BSE Mid Cap decreased by 41.52 points or (0.79%) to 5,193.51 and the BSE Small Cap fell by 57.13 points or (0.95%) to 5,957.53. The Overall market breadth is negative as 542 stocks are advancing while 1100 stocks are declining and the 42 stocks remained unchanged on BSE.